There's this thing about setting out to inspire young women and single mothers (and even "coupled up" mothers) to walk by faith, work hard, go get their dreams, and do the damn thing. It's this: sometimes you don't feel that inspirational. Sometimes you don't feel like you're walking by faith, like you're working hard, like you're going after your dreams, like you're doing the damn thing. Let me personalize this a lil bit. Sometimes I don't feel like I'm walking by faith. Sometimes I don't feel like I'm working hard. Sometimes I don't feel like I'm going after my dreams and defining success on my own terms and doing the damn thing. Sometimes, I just don't. And by "sometimes," I mean "these past few weeks." And it's really, really hard to put on a happy face, push pass the stuff and the muck and the mess that life throws at you, and, well, share a story (or two) that'll bring inspiration to a mother (or two). The bottom line is this: it's more than being just about me. I've gone through many things in my life; I've had many trials and triumphs, successes and lessons learned. I've hit rock bottom. I've failed. I've cried. Over and over again. But I've always had a little more faith, and a little more fight. And so. I've been blessed enough to spread some resilience on this here place and space. Because... it's about us, the collective. It's about using my gifts and sharing my stories to try to inspire other folks. It's about trying to play a small role in helping all of us "make it," whatever that may mean. 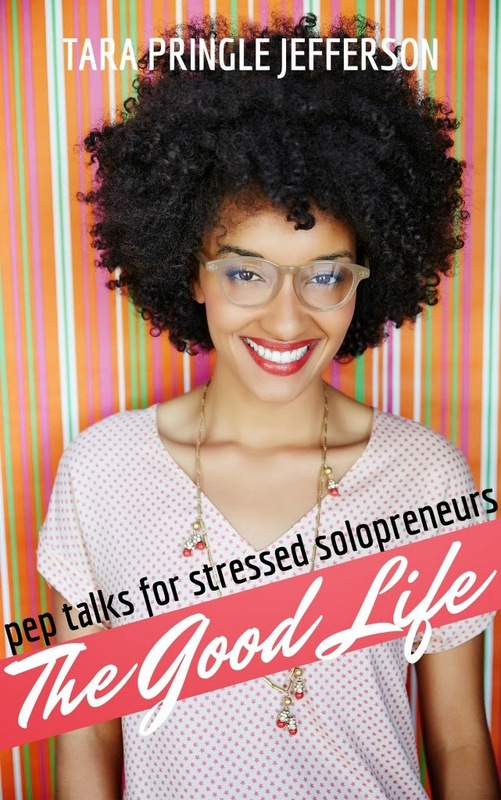 That's exactly what my girl, Tara did when she penned her new book, "The Good Life: Pep Talks for Solopreneurs," which is now available on Amazon! If you have a side hustle you hope to make your main hustle, this book is for you. If you have already launched your business but are struggling daily with self-doubt and fear, this book is for you. If you need tips on managing your thriving business life with your thriving personal life, this book is for you. The book just dropped this week and I've already started reading it. And, in short... I'm loving it. Tara writes openly and honestly about what it truly means to make lemon out of lemonade and take on the challenge of being her own boss after being let go from her full time job. She also lets us know that it's not all peaches and cream when you're your own boss because you have to face many dark days and many unknowns. The book is the epitome of my motto for this year: start where you are, using what you have, and walk by faith. Do you think this book would be appropriate for a 12 year old? My niece is in middle school at Girls Prep, and I feel like I've already heard her talk about how important it is to be resilient in her own life. I feel like this might be an inspiring read for her in creating her future career path. Forwarding your question to the author of the book. I'll let you know what her thoughts are!